* * * * * * * * * * Welcome to Dru's Cozy Report: May 2015. This month we have two recently released new series for your reading pleasure. Enjoy! 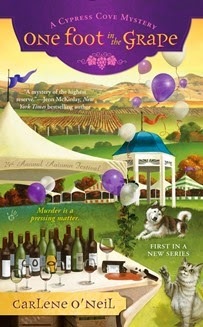 In California wine country, the town of Cypress Cove may seem peaceful. But someone’s about to pop their cork. But Penny’s search for answers sours after the body of a staff member is found in a grape crusher. Since Hayley was the last to see him alive, she’s the prime suspect in the case. Now Penny must hurry to find the real killer before Hayley withers on the vine. I like it. The author did a great job in presenting this story with an interesting cast of characters and engaging conversations. The tale had a nice pace that was easy to follow from scene to scene. I love the way the author grabbed onto the essence of this drama where the suspects were plenty and the drive to figure it all out had me quickly turning the pages to find out what happens next. With bits and of clues dispersed throughout the drama, my attention was captured when at first I thought I had an idea of who was the killer, and it was one smidgen of a clue that I knew who it was and I enjoyed watching it all played out as the author’s written words drew the ring around the killer. Penny is very likable and a good team that includes Hayley, Connor, Anne, Ross, Thomas and Antonia completes her inner circle that provides a well-rounded mystery that is a welcome addition to the cozy genre. This was a good read and I can’t wait to see what happens next in Cypress Cove. Talia Marby serves up delectable English deep fried fare in the heart of the Berkshires—but she soon discovers there’s something fishy going on. But not all the shop owners are charming. Phil Turnbull has been pestering Bea to sign a petition against a new store opening up, and his constant badgering is enough to make her want to boil him in oil. When Talia and Bea stumble upon Turnbull murdered in his shop, the police suspect Bea. Now it’s up to Talia to fish around for clues and hook the real killer before her friend has to trade serving food for serving time. I enjoyed this evenly paced and light fare drama that was delightfully entertaining. We are introduced to Talia whose return home is marred when her beloved boss becomes a prime suspect. What else is she to do but look for a murderer among the other shopkeepers. I love the flow of this well-written plot that moved effortlessly towards a conclusion with bits of Talia’s backstory and a slew of suspects that was fun to watch as the clues populated this tale. The author was very adept at pulling it all together with a sizzle of suspense and intrigue into the characters’ life that enable me to keep up with the story as the search for the killer narrowed down as I moved closer to the end. The conversational dialogue was believable and I like that Talia forced herself to get involved when it looked like the police was stalled. Talia is a likable heroine who is surrounded by an eclectic cast of characters and I look forward to the next book in this series that will bring new and exciting opportunities to Talia and her friends. I am looking forward to reading both of these books! Thanks! Thanks, Dru! I want to read both of these books, too! Am looking forward to reading both of these! I love reading new to me authors! 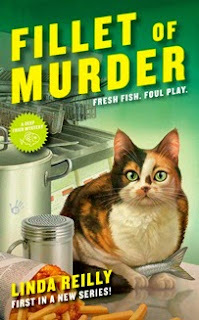 They both sound very nice Dru, especially the English background of Fillet of Murder. Does it have a lot of strange sayings?